Some of our sabs headed over to Northamptonshire for a few days at the Earth First! summer gathering to network, see old friends (and make some new ones), learn some new skills and to update other campaigners on hunting and the badger cull in the three counties and beyond. We did a talk on Sunday morning with input from sabs and anti-cull campaigners from other groups and made some new connections with people who are heading into the Gloucestershire area soon to give Gloucestershire Badger Office a hand against the cull. We’ll be focusing heavily on hunts in the cull areas in the three counties over the several months which the hunting season lasts for as well as the cull once it kicks off here. In the meantime, thanks to everyone who made the gathering great this year, hello to our new friends and thanks to those who we learned some useful new skills from and information on other campaigns such as fracking! We hope to be able to build further networks and help out more in the coming months! Probably a good time to link to Frack off our Forest and the Forest of Dean Wild Boar Cull Saboteurs as those campaigns are very local to us. That sounds catchy, right? This is just a quick post to say a huge thanks to Cornwall Badger Rescue & Brock (and “A” who told us about the rescue), Devon Hunt Sabs and Kernow Hunt Saboteurs for their help last week when a couple of our sabs were in Cornwall for a few days and spotted a young fox suffering from mange. We recently contacted the Malvern Hills Conservators with regards to the use of the Malvern Hills by the Ledbury Hunt, seen in the following video chasing a fox up into the hills back in December last year, the terriermen found elsewhere on the hills acting suspiciously around a badger sett before one of the supporters / unofficial helpers of the terriermen, Will Hunt, assaulted a member of 3C Sabs. The video of the assault can be seen here – Will Hunt agreed to a ‘community resolution’ after the police investigated and had to pay £100 to Vale Wildlife Hospital as part of his apology. 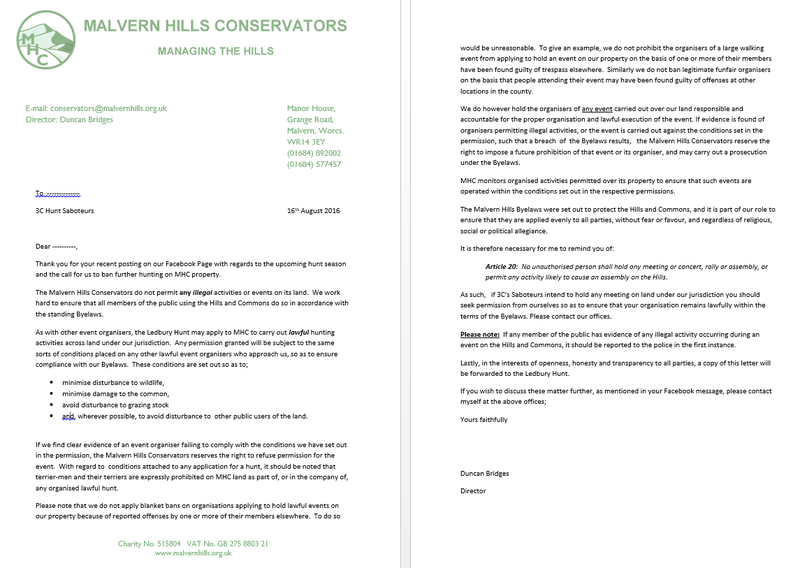 The Malvern Hills Conservators have replied to us since with this response. We’re a bit confused as to why they think 3C Sabs would be holding an assembly on the hills and why they seem more concerned about that, but it’s good to know their initial feelings on the situation. We shall be following this up with further details from this last season and with any incidents in the upcoming season with the hunt. “Thank you for your recent posting on our Facebook Page with regards to the upcoming hunt season and the call for us to ban further hunting on MHC property. The Malvern Hills Conservators do not permit any illegal activities or events on its land. We work hard to ensure that all members of the public using the Hills and Commons do so in accordance with the standing Byelaws. •	and, wherever possible, to avoid disturbance to other public users of the land. If we find clear evidence of an event organiser failing to comply with the conditions we have set out in the permission, the Malvern Hills Conservators reserves the right to refuse permission for the event. With regard to conditions attached to any application for a hunt, it should be noted that terrier-men and their terriers are expressly prohibited on MHC land as part of, or in the company of, any organised lawful hunt. Please note that we do not apply blanket bans on organisations applying to hold lawful events on our property because of reported offenses by one or more of their members elsewhere. To do so would be unreasonable. To give an example, we do not prohibit the organisers of a large walking event from applying to hold an event on our property on the basis of one or more of their members have been found guilty of trespass elsewhere. Similarly we do not ban legitimate funfair organisers on the basis that people attending their event may have been found guilty of offenses at other locations in the county. We do however hold the organisers of any event carried out over our land responsible and accountable for the proper organisation and lawful execution of the event. If evidence is found of organisers permitting illegal activities, or the event is carried out against the conditions set in the permission, such that a breach of the Byelaws results, the Malvern Hills Conservators reserve the right to impose a future prohibition of that event or its organiser, and may carry out a prosecution under the Byelaws. MHC monitors organised activities permitted over its property to ensure that such events are operated within the conditions set out in the respective permissions. The Malvern Hills Byelaws were set out to protect the Hills and Commons, and it is part of our role to ensure that they are applied evenly to all parties, without fear or favour, and regardless of religious, social or political allegiance. Article 20: No unauthorised person shall hold any meeting or concert, rally or assembly, or permit any activity likely to cause an assembly on the Hills. As such, if 3C’s Saboteurs intend to hold any meeting on land under our jurisdiction you should seek permission from ourselves so as to ensure that your organisation remains lawfully within the terms of the Byelaws. Please contact our offices. Please note: If any member of the public has evidence of any illegal activity occurring during an event on the Hills and Commons, it should be reported to the police in the first instance. Lastly, in the interests of openness, honesty and transparency to all parties, a copy of this letter will be forwarded to the Ledbury Hunt. Today it was Herefordshire country show at Caradoc Court. With it being bang in the middle of South Herefordshire Hunt country, owned by former master Major Darling, attended by 2 of the other packs we frequent – the Ledbury and the Ross Harriers – AND in the middle of the Herefordshire Badger cull zone it would have been just plain rude not to attend. Within minutes of us entering the show we were stopped by security accompanied by police and told to leave. We pointed out we were on a footpath. They said that all footpaths were closed. We asked to see the paperwork, they then said we could stay but only if we behaved. He added that the SHH were not parading. So off we trotted bumping into one of the masters of the Ross Harriers who said, somewhat darkly, that the cull was going to be rolled out very widely this year. We also bumped into the chairman of the SHH and some SHH members who didn’t know what they were going to do come cubbing. They all seemed to scuttle off to the beer tent a bit quickly. We saw some very nice landrovers and looked on in horror as someone walked past with a goldfish in a bag. We’re in the last weeks of ‘freedom’ before it all kicks off again with the hunts out cub-hunting (article coming soon) and the cull likely to start soon too. It feels like the season didn’t finish as we’ve been doing a lot of work regarding the hunts over the last few months and the cull certainly feels year-round with preparation and monitoring going on almost daily. It makes us stronger, so it’s worth it! We were in the fields for 5 days solid last week sett surveying in what will probably be roll-out areas and also happen to be areas where we sab’ so we’re gaining lots of useful information for the future to protect wildlife. The setts that we found had been blocked some time ago and we’re near pheasant pens. They looked healthy enough though. Cirencester Illegal Hunt Watch, who we help out in that area, were also out. On Saturday we did a talk on the badger cull at the Milton Keynes vegan fair. This was superbly organised and we noted that many local people were coming in to enjoy the food and music. We hope that our fellow sabs – Beds and Bucks – did well, they seemed to be inundated on their stall by those enquiring! Yesterday we did a skill share in conjunction with Gloucestershire Badger Office covering subjects including map reading, cub-hunting, the badger cull, police liason, legal stuff and radio comms. Thankyou to all who attended and to Outpaced, freebeagles, Zed 16 and our new police liason person for the Gloucs cull. We will be organising more skill shares after the badger cull so watch this space. Just about to get back into the field to find more setts. Please get involved if you can in fighting the cull. There is a job for everyone just get in touch with the zone nearest you, or where you would like to go or feel you will be most effective and your help will be most welcome. If you can’t get to a zone, map your own area, or work from home by sharing posts, re-tweeting and ‘All That Kind Of Stuff’. We are facing a massive challenge with cub hunting (along with sett blocking) and the badger cull starting in the next few weeks. Time to dust off those boots, pack the tent, and start preparing. Check out our new ‘Terrierwork’ article, useful for anyone out during the culls who comes across a hunt or who is out looking out for their local hunts!